A fellow viewer found this recipe of one of Houston’s most famous restaurants in the Houston Chronicle. It is made in a fluted 10-inch pie pan with removable bottom. If you can’t find it then use a deep – dish pie pan or a 13 x 9 x 2-inch baking pan. You will be happy with this rich and luscious pie. 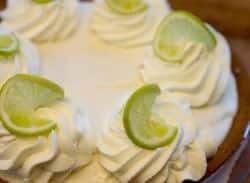 You can recreate Key Lime Pie from Anthony's, a well-known Houston restaurant. In a bowl, combine crumbs, brown sugar and melted butter. Press mixture 1/4 to 1/2 inch thick on bottom and sides of 10x2 inch deep fluted pie pan. In another bowl, mix condensed milk, egg yolks and lime juice on low speed of mixer until well-blended (it should be creamy color and slightly thickened) about 2 minutes. Pour into prepared pie shell and bake in preheated 350 degree oven 18 to 24 minutes (pressing surface lightly with finger should leave a mark). Remove from oven and let cool. Refrigerate 6 to 8 hours before serving. Garnish with sweetened whipped cream, fresh lime slices and mint sprigs. It would be 12 fluid ounces. And is there a video about that key lime pie? This pie was absolutely wonderful I made it for a dinner party and everyone loved it!